SOLIDWORKS PCB's new Parts Providers function facilitates the linking of your design components to real-world parts, enabling you to have access to live supplier data at your fingertips as you design. The new Parts Provider options have been added to the Data Management - Suppliers page of the Preferences dialog. 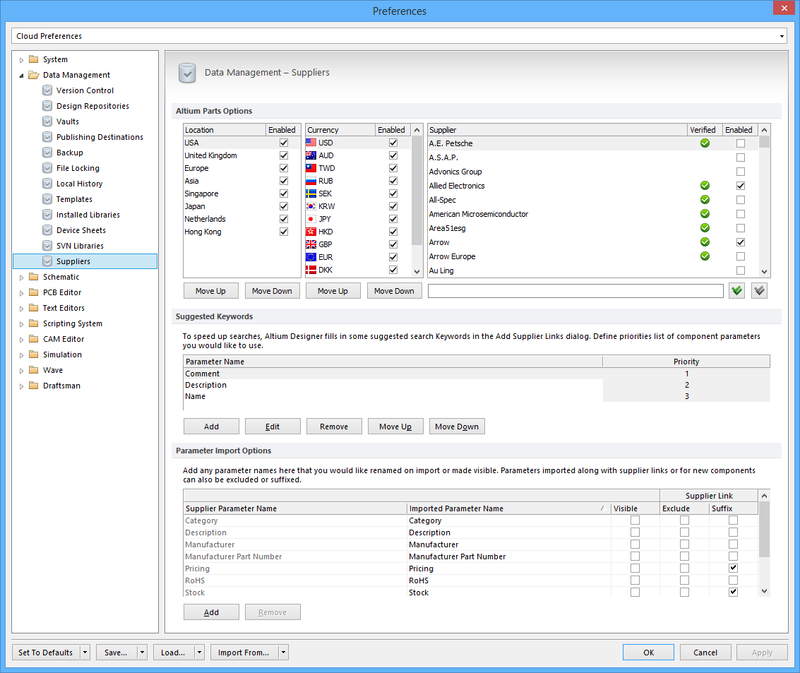 Configure options relating to the feature to link to Supplier data as part of your Altium Designer preferences. Use the Altium Parts Options section to configure the service to suit your needs. Location - enable from which geographical regions the parts service will collate parts data. While many suppliers are multi-regional, if a part is uniquely available in a specific location, it will only be listed if that region is enabled. Currency - enable which international currencies will be available for selection when searching for parts and examining results. Supplier - enable which Suppliers to include when performing a supplier data search. Only part results from those Suppliers will be returned. Simply enable those Suppliers that suit the procurement preferences of your company. By including more Suppliers for use with the feature, you are able to compare and shop for the best deals on the components required by your design. A majority of the Suppliers are listed as being Verified ( ). This simply means that a Supplier is a partner of the aggregator service that underlies the Parts Provider, has proven to own its own stock, and its data feeds are real (considered trustworthy). Locations and currencies can be ordered, allowing you to set an order of priority, with your preferred entry at the top of the corresponding list. Available Suppliers, listed at the bottom of the Data Management - Suppliers page, can be enabled, disabled, and ordered by priority as required. If an account is already held with a Supplier (existing customer), you may be entitled to special pricing or products that are not available in that Supplier's public catalog. If this is the case, simply ask that Supplier's sales representative for a username or customer number that can be used with their Web Service. Having gained this information, enter it into the options section for that particular supplier. Making use of these additional supplier options is a wholly optional exercise. You are not required to fill out these details in order to link to Supplier data, they simply offer additional benefits for those users that are existing customers of a particular supplier,should they wish to access them.